This is the first step for the uninitiated, or the returning student who feels like they’re essentially starting over. This course is a progressive 16 week program requiring pre-registration, and is the only class that does not permit drop-ins. Rudimentary technique and basic vocabulary (physical and musical) are developed through short, repetitive combinations to prepare students for beginning classes at any studio. These beginning classes refine and expand upon existing technique and essentials of the Intro to Tap class. Increased fluency and comfort in beginning level material means that the classroom pace picks up. Combinations and choreography utilize greater rhythmic sophistication and asymmetrical movement. Rhythm drills prepare students for improvisation. Relevant tap history is always integrated into each class. With greater fluency expected, the physical and musical demands increase. Improvisational skills are developed, complicated choreography (original, and historical pieces), musicality (tone and dynamics), orchestrated tap (including canons are explored) and more complicated rhythm drills challenge student’s sense of time. Flash is introduced through careful progressions. Specific aspects of historical figures and their contributions are analyzed and learned. These classes move at a quicker pace, require less technical explanation, but more personal accountability (students are encouraged to ‘stand alone’). Students are equipped to develop their foundations in flash, deepen their awareness of the masters, and demonstrate their artistic maturity. Choreography and improvisational drills challenge conceptions and use of tap as a performance and expressive medium. Many drills train students’ ears for greater “metronome sense” in preparation for polymetric hearing. Classes at this level are much more progressive in developing the artist through the culmination of their tap experience. A very progressive class which focuses on the development of the individual. Elements of style are discussed and through exploratory drills and assignments students begin to define themselves. Structured (and sometimes free) improvisation is often used to exercise new concepts and developments. The Intro to Tap class does not run end to end/session to session. It requires a minimum of 9 students. When there are enough interested parties the session can start. What has worked in the past is submitting your contact information (name, phone number, and email to the teacher Gregg Geoffroy). He will add you to the list and give you a follow-up call to inform you of a possible start date. In the rare event that a session isn’t going to happen for awhile Gregg suggests a private lesson to get you going and then a drop-in date to the existing class. Particularly if you’ve already had some tap lessons. Students are strongly encouraged to pay for the session upfront, which keeps them motivated/invested in their development. To reinforce this, classes will cost much less than the drop-in rate (details when you talk to Gregg). Unless you already have tap shoes don’t buy them before taking the first couple of classes and/or have talked with Gregg. He will make recommendations and help you decide by giving you information to consider. For the first class or two you can wear any low-heeled, solid soled shoe (preferably lace up, or at least very snug). Rubber soles and heels are not recommended. Any additional questions, direct them to Gregg. Designed for everyone, every shape and age. All exercisers from beginner to advanced will enjoy the benefits of a Zumba class. Attire: Comfortable fitness clothes and low tread athletic shoes. I love teaching Zumba classes. The reason is simple: Every class feels like a party! Come join me and you’ll see what I mean. You don’t even have to know how to dance. Just move your body and follow my lead. It’s easy! Come try it, I guarantee you will have a blast! I look forward to meeting you! This class is designed for students with little or no previous tap experience. Students are taught basic tap terminology, rhythm, coordination, and choreography. We will begin the class with warm up exercises in which students are taught rhythms, timing and coordination. Then we continue with travel exercises across the floor and conclude with learning complex rhythmic combinations and routines in the center. Tap shoes are required. This class is for advance beginning/intermediate level students with extended knowledge of tap vocabulary. We will refine tap tecnique, work on developing speed and improving musicality. 2 years of tap dance experience is required. This class is for students without previous experience. You will learn fundamentals of swing dance as well as basic Rock&Roll steps. Students should wear comfortable clothing and shoes. This class prepares you to participate in dance competitions and showcases. Swing, Lindy Hop, Acrobatic Rock&Roll, Charleston and many more will be covered. Previous 3-4 years of dance experience is required. Students should wear comfortable clothing and shoes (no street shoes). In this class students will work on building a strong technique base while exploring a range of world dance forms. We will focus on creating a fluency with Modern and Jazz dance technique, as well as introducing movements used in African dance styles, Latin dance, and Hip Hop. Students will have the opportunity to create their own dances, and also learn and develop choreography in preparation for performance. Each class will consist of a warm up, learning dance vocabulary, movement across the floor, creating individual/group dances, developing choreography, and fun dance games. Please email me to register and reserve your spot! Tai Chi Chuan is known for its many health benefits for both body and mind and promotes an overall sense of well-being, vitality and inner calm. The gentle flowing movements of Tai Chi encourage the body to let go of any stress or tensions: balance and flexibility improves, joints/ligaments and muscles are strengthened, blood circulates more freely and the mind and spirit become clear and full. 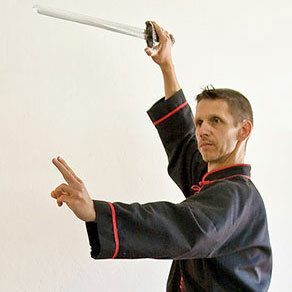 Andreas has studied Yang Style Tai Chi Chuan in the Plum Blossom International Federation (founded by Grandmaster Doc-Fai Wong) where he also took part in martial arts tournaments, placing in medaling positions. Andreas has the special capacity to teach the preciseness, purity and beauty of movement and at the same time to transfer the experience of flow and a feeling of connectedness of body and mind to his students. Learning Tai Chi Chuan therefore not only becomes a physical exercise but also a deeply spiritual art form and experience that equally involves and stimulates the heart, mind and spirit. The integration of Tai Chi forms and Qigong exercises into the class schedule also helps students appreciate and experience the meditative aspects of Tai Chi Chuan very early in their practice. Our Yang style curriculum offers beginner, intermediate as well as advanced classes. Beginning students learn the basic Tai Chi postures and movements and then gradually progress to more advanced hand and weapon forms. For classes other than the Beginner I class on Thursdays, prior Tai Chi experience is recommended – please inquire with the instructor before planning to attend classes at the higher levels. Private lessons for any form in our curriculum are available upon request. For questions or inquiries please visit taichichuanberkeley.com where you can find more details as well as contact information. We hope to be able to welcome you in one of our classes soon. Based on the Lester Horton technique and modeled after the style of Alvin Ailey, jazz blues is a fun, vigorous, funky, energetic and contagious form of interpret dance. You will take part on a journey of self discovery, engagement and exploration. Class will be using a unique and creative process of dancing to choreographed warm-ups and combinations that culminate to more elaborate movement patterns and sequences. We will travel through space and dance to combinations incorporating a blend of lyrical, adagio and allegro movement and music. Jazz Blues brings together creative music from various genres, including, jazz, blues, soul, gospel, techno and rhythm and blues. Class will place an emphasis on body alignment and placement, technique, focus, musicality, spatial awareness and a marriage between jazz styles fused with ballet and modern techniques and vocabulary. Looking for a new challenge? This class brings together the fusion of creative movements and rhythms choreographed to the music of world beats from various genres. Class will explore multiple rhythm patterns and movement phrases, students will learn and develop the proper techniques for building healthy, strong and flexible muscles. We will learn basic body alignment and placement beginning with simple to more complex warm-ups and body isolations. The class will also explore an array of styles and dance forms that will represent many cultural genres of movement, including: Jazz, Modern, Salsa and Latin, Samba, Hip hop, African, Haitian and free form. Roger’s supportive environment encourages timid students while challenging those who are already kinesthetically oriented. I forgot to mention, it’s a whole lot of fun.